Not everyone connects to nature by serious hiking or birding or other “outdoorsy” things. Often, it’s something very simple in our own backyards, like an anole’s crazy antics to catch its dinner. Suddenly, we become observers of the tiny things in our big picture. Perhaps it’s a plant that catches our eye and imagination, like native Gaura lindheimeri waving in the breeze to entice butterflies to nectar. Here’s how to grow it. We’re on the way to work and spot a corner garden, rich as Disneyland in color. We stop for a closer look and spy excited bees on native pitcher sage (Salvia azurea). Perhaps Yellow Bird of Paradise (Caesalpinia gillesii) prompts a new small shrubby tree for our water saving garden. standing cypress (Ipomopsis rubra) took the show. I missed the hummingbirds, but you know they were nearby! One summer evening, this giant leopard moth (also called great leopard moth) decided to hang out with us on the patio, perhaps because we let it crawl all over us when it was a giant woolly bear caterpillar. Capital Area Master Naturalist Marc Opperman knows how to spy wonders big and small. He joins Tom to tell us how this volunteer group has enriched his perspective on all things outdoors. Since its inception, the Texas Master Naturalist program has trained more than 9600 volunteers across Texas. In their spare time, they’ve contributed 2.8 million hours in their communities to nature education, stewardship of natural areas, and as warriors against choking invasive plants. Marc, like all Master Naturalists, went through intensive training. Once certified, each year they volunteer 40 hours and attend another eight hours of instruction with experts in all fields. Volunteers select their area of interest, including bird counts, plant surveys and amphibian watches. Marc especially likes his stewardship and outreach work for Austin Water Utility’s Wildland Conservation Division, engaging in projects to help protect water quality and essential wildlife habitat. Master Naturalists learn about native plants and our creatures, like this Southern Leopard frog that showed up in Marc’s garden after all the rain. Capital Area Master Naturalists is accepting applications beginning August 1 for the fall session. From the entomologist experts, you can learn about beneficial insects, like the Eyed click beetle that devours pest larvae. Here’s how to connect to the Master Naturalist program in your state. For more information, check out the Texas Master Naturalist Statewide Curriculum from Texas A&M Press. 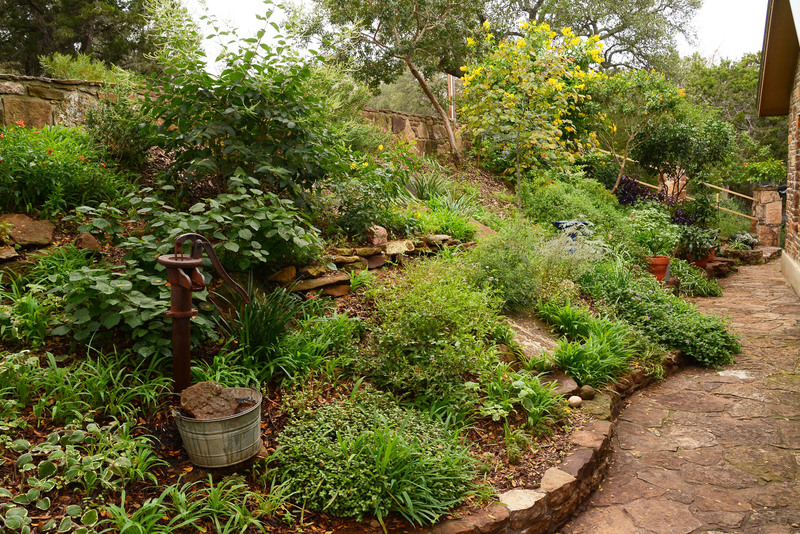 And follow Marc’s personal discoveries on his blog, Garden Austin. After running around all day discovering wondrous things—like all the weeds popping up in your garden thanks to rain—cool down with one of Trisha’s refreshing garden cocktails! Fruits and herbs combined with your favorite liquor will turn you into a mixologist extraordinaire. Get the recipes! On tour, Laura and Travis McGarraugh and their children Naomi and Daniel discover lots of fun things right at home since they dumped the lawn in favor of two ponds. Instead of mowing, they hang out on the patio. Refreshing even in summer, thanks to the trees and sound of water, the outdoor living room is also soothing therapy for Laura after 12-hour shifts as an ER nurse. She and Naomi team up to accent with colorful creative containers. “It’s a fun project after school. We call them our pot projects,” Laura says. Naomi’s favorites are the succulent designs she creates. African Gray parrot Taz claims the overhead perspective when he comes outside with the family.